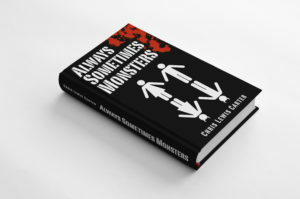 Always Sometimes Monsters: Stories is available on Amazon Kindle for only $0.99. But if you just want a PDF, that’s totally okay. Admit it, you’re not a good perso n. Sure, you try to be polite to telemarketers, and you occasionally remember a co-worker’s birthday, but underneath the table manners and forced smiles, you’re barely suppressing the urge to dive headfirst off the straight and narrow. It happens to everyone sooner or later, so why not consider these eighteen (mostly) horrifying tales of succumbing to the darkness lurking within us all. Find out why some old video games aren’t meant to be played in “Kill Screen.” Discover what happens when a cordyceps fungus meant for African Bullet Ants begins to infect humans in “The Cord.” Learn the five key steps to selling any product (during the apocalypse) in “Magic Man.” From Sea Monkeys to Professional Wrestling, Tarot Cards to Time Travel, each of these stories prove that we’re never always perfect, but we’re Always Sometimes Monsters.